We’re working hard to pack and ship the MakerSlide orders (actually, all orders without eShapeoko kits). We have inspected the MakerSlide for defects, and picked all the other items ordered along with it. We began packing everything. We plan to post/drop off/have the couriers collect most of these orders, if not all of them, by Thursday. Once these are out of the way, we’ll focus on the eShapeoko kits. As of a few minutes ago, you can order the eShapeoko kits in the store: original (one size only), and open end plates (configurable size). We’ll see how it goes, but I think it may take us between one and three weeks to ship your orders. We’ll do our best to make it as quick as possible, and to keep you up to date with the progress of your order. Have you noticed the trapezoidal screw upgrade? It uses a Tr 8 x 2 screw (“metric Acme”) instead of the old M8 threaded rod. The leadscrew is supported only at one end, just like the M8 rod was, but I’ll make a thingamajig with a bearing in it (that’s the technical term — actually, it’s called a pillow block, but how’s that any better?) to support the other end too, if you want to be able drive it even faster. Once we catch up with the orders (one can only hope), I’ll make the trapezoidal leadscrew available as an upgrade. It also works with the Shapeoko 2, and it can be made to work with the Shapeoko 1 too, if there’s interest (you need a few extra parts). Another new option is the “deluxe frame”. Instead of just two pieces of T-slot aluminium extrusion to connect the end plates, you get four of them and the hardware to tie them together to make a sturdy rectangle. The end plates attach to the outside of the transversal members, just as before, and the mid-span supports to the inside of the longitudinal ones (illustrations and assembly instructions to follow). We have practically all of the parts, with some of them already counted and packed. The parts we don’t have on hand for all the kits are commodity items we tend to order as we go, such as standard aluminium extrusion. We don’t have as many bearings as we’d like, but more are on their way; hopefully, this won’t cause any delay. There’s also an assembly we need to put together ourselves (more on that in another post). I’m still working on the number crunching side of things, because the pricing spreadsheet was woefully out of date: both the prices and the list of parts that go in each option of the kit were wrong. I’ll finish this weekend, so that I can update the prices, add the new kit options, and turn ordering on. We have reopened the store. I updated the Royal Mail shipping prices, in line with their annual price hike (they added 20 pence for UK and the rest of Europe, 35 pence for Australia and New Zealand, and 25 pence for the rest of the world). I expect many MakerSlide orders. We’ll ship them as soon as we can, but please bear with us. I’ll keep you up to date with shipping estimates. 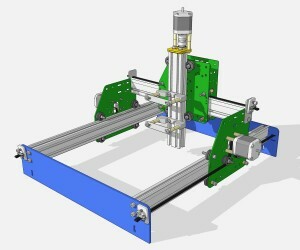 The eShapeoko kits will be back on sale, with MakerSlide included, later this week (watch this space). At long last, I put the drawings of the laser-cut metal parts on GitHub: https://github.com/amberspyglass/parts/. A few are parts designed specifically for the eShapeoko, but most are generally useful MakerSlide accessories. For instance, parts EM-LZP and EM-LZS, the eShapeoko Z motor plate and shim, can also be used for a leadscrew-driven standard MakerSlide carriage (EM-LCP or EM-LCM). The machined custom parts (V-wheel and idler sleeves, eccentric spacers, lead nut, spindle mounts) are the same as the ones used by the Shapeoko and sold by Inventables, and they are made from the same drawings. If you’re interested in parts that we don’t yet sell separately in the store, please use the “Contact Us” link in the store to suggest a kit or to request a price for a specific list of parts. It looks like we will be able to reopen the store on Tuesday 22 April, as promised. MakerSlide is in stock (although some length may go out of stock briefly, because I’m still fighting the inadequate stock management feature of the store software). More stock is available on short notice (one or two weeks) from the uncut stock at the factory, and yet more can be extruded fairly quickly, now that we have a die with a reliable supplier. 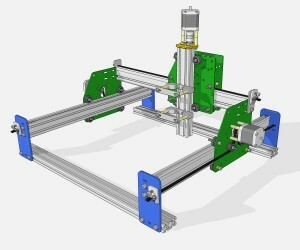 The eShapeoko kit will be back in stock and available to order this coming week. I expect enough orders to create a large backlog; it may take us three weeks to ship the orders received in the first couple of days. Of course, I’ll keep everyone updated. Due to a combination of family, health and supply circumstances, our online store is closed until after Easter. We will reopen on the 22nd of April. We will ship existing orders by the end of this week, but you will not be able to place new orders until the 22nd. We realize this is very awkward, but we prefer to stop accepting orders, rather than take orders, sit on them for three weeks while we’re not able to fulfil them, and create a backlog that will take a long time to clear. MakerSlide is back in the store. You can buy it in these lengths: 2 m, 1.5 m, 1 m, 750 mm, 500 mm, 375 mm and 250 mm.